XPI Raw wants you to get the most out of your supplements, with single ingredients that are easily stackable and customizable, and that offer potent supplemental power. This pure and simple D-Aspartic Acid can help you boost your testosterone levels for increased fertility, improved workout performance, and extra energy. D-Aspartic Acid can help to keep cortisol (the stress hormone) levels low, leading to less body fat and improved muscle mass. It can also improve your sleep patterns, which aids in workout recovery and more energy for more workouts. Better sleep also helps boost your immune system, keeping you healthier year round. Finally, D-Aspartic Acid can boost muscular vascularity for strong, clearly defined muscles. 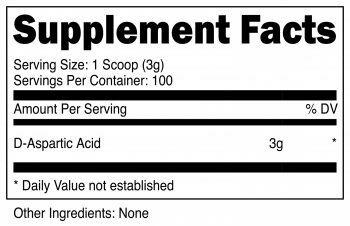 As a body building supplement, D-Aspartic Acid provides these benefits and many more, leading to more lean muscle mass, more endurance, and optimized testosterone levels. Including 300 g of pure D-Aspartic Acid, this simple supplement is just what you need to reach your weight-lifting and muscle-building goals. 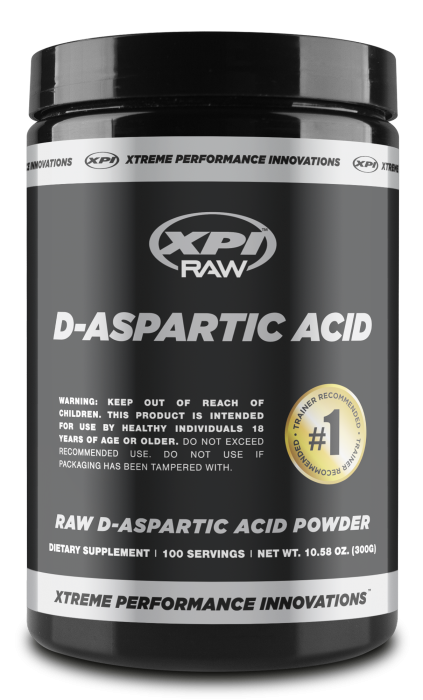 XPI Raw D-Aspartic Acid optimizes testosterone levels for improved athletic performance, increased energy, and accelerated recovery. 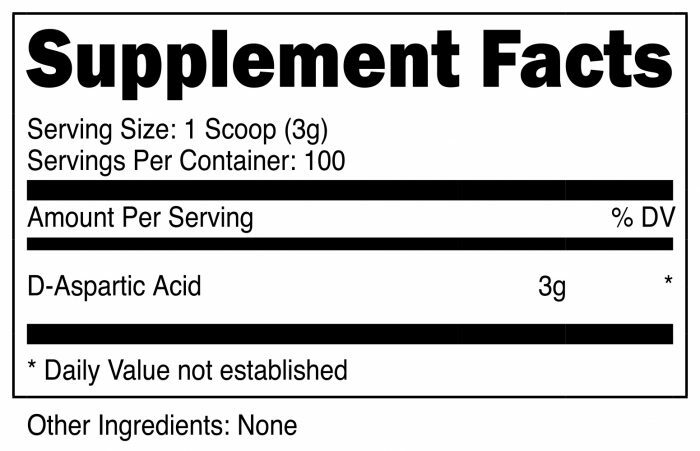 D-Aspartic Acid is a non-essential amino acid that is vital for testosterone levels. It can help to boost libido, mood and sleep patterns, endurance, and lean muscle strength. Q. Should I Cycle D-Aspartic Acid? A. The current school of thought is that D-Aspartic acid is best used in cycles to yield more promising results. The two primary cycles seem to be either 12 days on, followed by 7 days off, or 3 weeks on, followed by 2-4 weeks off. Unless advised differently by a physician. Q. Can Women Take D-Aspartic Acid? A. More research is needed to understand the effects of increased levels of D-Aspartic acid in women. One study seems to indicate that higher levels of D-Aspartic acid in women increases the conversion of testosterone to oestradiol, or estrogen. Therefor this would not have the same effect of the intended purpose of D-Aspartic acid in men, which is to boost testosterone levels. Q. Who can take D-Aspartic Acid? A. This product is safe for the use of healthy males and females ages 18 and older. While it is safe for women to use this product, a lower dose is suggested than that of men in order to maintain healthy hormone levels. Q. Are there any Negative Side Effects? A. There have not been any negative side effects associated with taking D-Aspartic Acid. However, if you experience any side effects, it is highly recommended that you discontinue your use and talk to your doctor.